Since the appearance of the reputation system, messages can be voted by the "+" or "-" button. However, many members have wondered if it is possible to only take into account the positive votes. This tutorial will explain how to remove the "-" button on all forum versions. - Have a basic knowledge of HTML, and templates. The changes are the same on both versions. Then click the "Publish" button. Here, the image chosen above has a width of 24px, so we put a value of 24px. If your image has a width of 35px, remember to adapt this code by changing 24px to 35px. And in particular Toto456 and translated by MrMario. No reproduction possible without our consent, in accordance with article L122-1 of the ICC. hi forumotion, I wanted to ask. why when I change the code, appears orders "The tag has been closed before being opened or the tag hasn't been opened." and can not be replaced. anyone know? I use phpBB2. sorry I am not good at HTML problem. Thank you so much, Typlo. My forum is for children, so this help reduce meanness. But of course adults are mean too. I was read this tutorial in another's FDF. Is absolutely great! 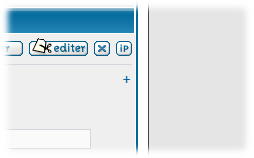 Also, after playing around with padding, etc, I got an image for the positive rep for the PHPBB3 version. Note: Depending on your board, you'll have to readjust the padding. 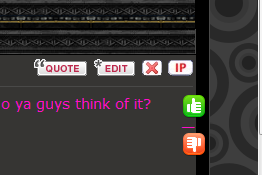 Thanks for the feature, however, That thumbs up icon should be possible on other forums besides only phpBB2 and punBB. @SPADEZ wrote: Thanks for the feature, however, That thumbs up icon should be possible on other forums besides only phpBB2 and punBB. Check my reply. It is possible with CSS. Why on earth would someone add display:none; to a template? Please people, use the CSS instead! It works on all board types. Changing the DOM in this fashion is poor HTML design practice. I strongly suggest that the original post be edited to only show the CSS solution for removing the minus sign. Do I have to think of everything for you? Hey, eToxic...let's talk. As you can see in this pic here: I am using Invision. 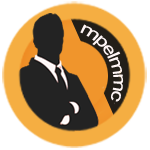 My forum link is in the obvious location of my post profile. I took me a while. Your gonna have to play around with the padding. Didn't work, I already tried that. Their is something in that code that is missing to work on my forum I guess. I use a website debugger (firebug) and I was adjusting the padding values on the fly and nothing I put allowed it to show as a full icon for some reason. Try editing it on the live version, perhaps? Yes, it's the same difference only with firebug i can modify it without going through my ACP back and forth saving and cancelling. I am writing a tutorial that will show how to replace the +/- characters in the vote buttons with images. The tutorial will work on all four forumotion board types. I'm read this tutorial in other forum ! for (-) who is the code? Thanks for enabling removal of this, makes my site more friendly. it doesnt work in phpbb3!!!!!!!!!!!!!!!!!!!!!!!!!!!!!!!!!!!! @Dion wrote: Why on earth would someone add display:none; to a template? I can't remember why I put the templates modification for phpBB2 and punBB in the original tuto, but if I did it while the CSS solution works, there is probably a reason. This does not work for phpBB3!